To be honest, this plant isn’t one that immediately comes to mind when I think of my top favorite perennials. The fragrant foliage is a treat, and the bloom spikes are magnets for bees and butterflies. Its flower color, however, is a washy purple-blue that’s anything but “wow”; to my eye, it usually reads as a hazy gray, and I much prefer bright, rich colors. I can appreciate its subtle beauty, though, particularly when it’s paired with similarly soft colors. The midsummer combination above is a perfect example. Here in Pennsylvania, the carpeting Wlassov’s geranium (Geranium wlassovianum) starts flowering in late spring, but it blooms over such a long period that there are plenty of flowers still around when ‘Blue Fortune’ begins to flower and ‘Skyracer’ purple moor grass (Molinia caerulea ‘Skyracer’) starts sending up its wispy plumes by early July. This full-sun-to-partial-shade combination certainly wouldn’t stop traffic; it has a lot of quiet charm up close, though. While the colors are harmonious, there’s pleasing contrast in the forms of the plants and flowers. Plus, they all flower pretty much continuously into fall. My preference for midsummer interest is the full-sun combination featured at the very top of this post: ‘Blue Fortune’ paired with ‘Anthea’ yarrow (Achillea). Both colors are still on the pastel side, but there’s contrast in both color and form, so it’s far more dramatic. On the down side, I find ‘Anthea’ to be fairly floppy (probably because my soil is on the moist side), and though it reblooms to some extent if cut back in early August, it never repeats the glory of the first flush. Still, it’s a great show for a good part of high summer. By late summer, the spikes of ‘Blue Fortune’ continue to elongate. The tiny flowers drop off as they age, but the remaining parts still keep some color, and new blooms keep forming. 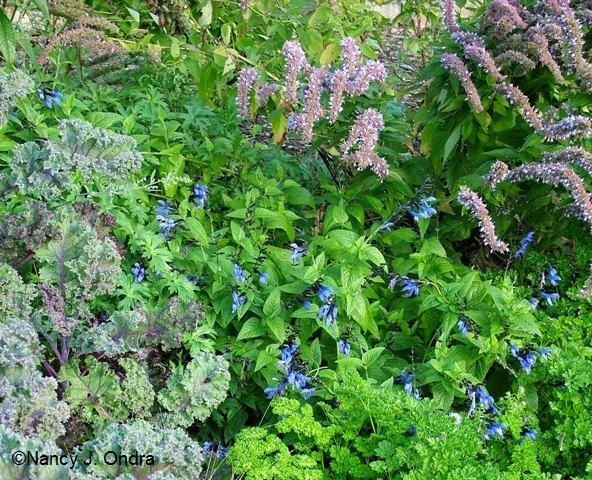 This late August grouping of ‘Blue Fortune’ hyssop with honey bush (Melianthus major) and ‘Ruby Perfection’ cabbage is another study in subtlety: not much color from the flowers, but good foliage and forms. Fast-forward another month, and ‘Blue Fortune’ can still be looking good. If you choose to snip off the flower spikes in mid- to late August, it’s back in bloom by late September and usually looks as good as it did in its first flush, with the added benefit of staying a more-compact 2 to 3 feet. This is the same combination shown above for midsummer interest; nearly three months later, all three plants are still in bloom. In a few more weeks, the moor grass will take on a nice yellow fall color, and the geranium leaves take on some bright red tints. ‘Blue Fortune’ too has some yellowish fall color, but I think of it more for autumn flowers than foliage. Left unpruned, ‘Blue Fortune’ keeps elongating its flower spikes, to the point that heavy rains can knock them askew, and their weight can cause the 3- to 5-foot-tall stems to sprawl, as evident in the late-September combo of ‘Blue Fortune’, Salvia guaranitica, ‘Redbor’ kale, and parsley above. They usually perk up once they dry, though, and some judicious trimming can repair the shape well enough to keep the clump looking decent for a few more weeks. This extended period of flowering interest is dependent on your getting the true ‘Blue Fortune’, which is a cross between A. rugosum and A. foeniculum and is supposed to be sterile. That means the plant puts its energy into producing new blooms instead of seeds, and you’re spared dealing with dozens of self-sown seedlings each year. If someone offers you seed or seedlings with this cultivar name, you’re probably not getting the true ‘Blue Fortune’. This perennial is usually rated for Zones 5 through 10, though it has a quirky habit of sometimes dying over winter even in zones where it’s fully hardy. I’d guess that it’s like blanket flowers (Gaillardia) and some coreopsis that way; it puts so much energy into flowering that it doesn’t store enough energy to get through the dormant season. Giving it a break by shearing off the flowers in August seems to improve the chances of successful overwintering. Frequent division (every 2 to 3 years, in spring) seems to help too. ‘Blue Fortune’ is available from many local and mail-order sources, but if you really want to be sure you get the right plant, look for a nursery that promises cutting-propagated plants, as High Country Gardens does. I think the unusually wet weather we had last year may have contributed to the extra height, Liisa. It seems much sturdier and denser in drier, not-extra-rich soil. Huh. 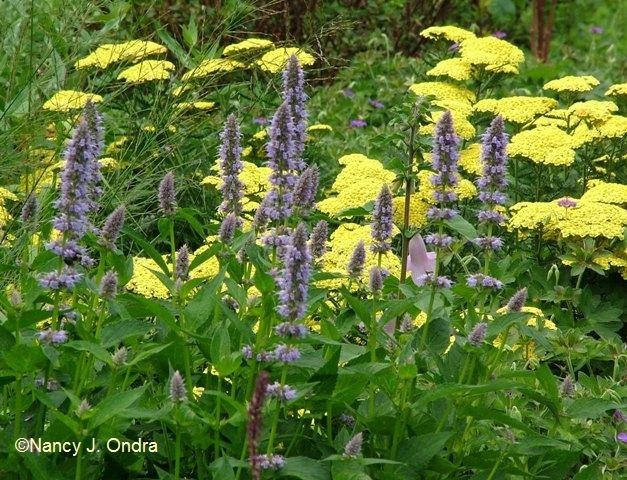 It sounds like someone may have mixed up an anise hyssop (Agastache) with regular hyssop (Hyssopus officinalis) as far as naming goes. Your description of the rounded leaves is sparking a memory of some seed strain of Agastache I grew within the past few years, but so far, I haven’t been able to remember the name associated with it. Have you posted any pictures of yours at Fairegarden, or could you send me one or more (nan at hayefield dot com)? Blue Fortune is one of my current favorites. I have several clumps planted near my hammock and I spent countless hours over the summer laying in the hammock with my camera capturing photos of butterflies and bees flitting from blossom to blossom. Blue Fortune was the primary butterfly magnet in my garden last summer and I am planning to take your advice and divide mine this sprng and spread the joy around my garden. Hi Debbie! I hope the division trick works for you; it did for me. I’m not a big fan of plants that need dividing that often, but this one’s worth the extra effort. Love the ‘Blue Fortune’/’Anthea’ combo, Nan! Agastache is one of the few plants that reliably survives every winter in a container on my deck. No fuss, no muss! I agree, it’s not my favorite in terms of ornamental value, but anything that might lure butterflies and hummingbirds for up-close viewing (and provides fragrant foliage to boot) is fine with me! Sounds like the good drainage of the container agrees with it. Good to know that it performs well in a pot too – thanks for the tip! Happy Bloom Day, Nan! This plant has what I look for in a perennial with my limited space. It’s preference for slightly dry soil works for me as well. Now I just have to figure out where to put some. It’s not a small plant, but it doesn’t seem to mind other perennials around its feet, so maybe you can tuck it into a spot where it can come up through some lower-growers that are already there? I was just looking at the High Country Gardens website for agastache, so this is a timely post for me. Really, who can fault a plant that blooms for so long? You’re right about the first combo – very nice. I really must get to work on re-designing my beds so I can fit some Blue Fortune in there. Nope, not much fault to find with this workhorse. Though if one were greedy, one could ask for oh…maybe bright purple flowers? *That* would really be something. But I love my ‘BF’ tall. Do I really have to cut it back in August? And two things about dividing plants that will have you yelling at me: 1) in my clay, it’s terribly, terribly, terribly awful and 2) it seems clear that I lose a season with the newly divided plants, which makes sense, but why not wait until the last possible moment (ugliness, death) to fix the situation? And let me ask this–is it true that, in general, most perennials like being divided every 3 years or so? In any case, I think I need to add to my BF collection because it truly is a 3 season plant. You don’t *have* to do anything, Benjamin. I like to do the August cutback to get the fresher look for late September and October, to minimize the stems splitting or sprawling, and to improve the odds of overwintering. If your plants are fine without it, then there’s no need. About division: for agastaches, I find that they grow so quickly that you don’t really lose a season after division; they won’t get quite as tall the first year, but they seem to bloom much more freely, so the plants still look great. I prefer to divide them in spring, because they look so good in fall. If I wait until late October, then the clumps frost-heave in winter; if I were to divide them in September, I’d miss their presence in the autumn garden. In general, I don’t routinely divide my perennials; I only do it when they show they need it, or if I need the divisions to fill in elsewhere. What I usually do is split the clump in half or thirds while it’s still in the ground and then lift only the parts I want to move; what’s left still has established roots. I do very little soil improvement, which is probably why my own perennials normally don’t need to be split frequently. I’ve seen the same plants growing in lovely loose, rich soil, and yes, they look great and fill in quickly, but they also seem to get overgrown and need refreshing far more quickly. Having read a Northern gardener say Melianthus is cut down by frost. Went out today, and cut mine back hard. There is new growth, but not as lusciuos as your picture, as we are waiting for March and the rain. One whole millimetre yesterday! You’re so lucky to be able to keep your melianthus. The plant in my picture is pretty much the best I can get by the end of one growing season (starting with a new, small potted plant each May). I wish I could send you some of our precipitation! Nan, what a beautiful post. 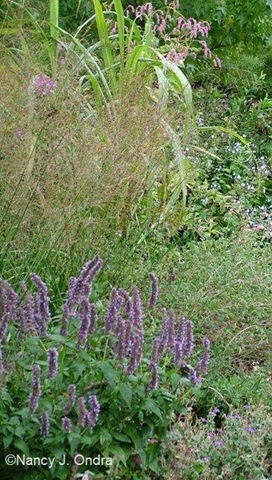 I just love the Agastache. 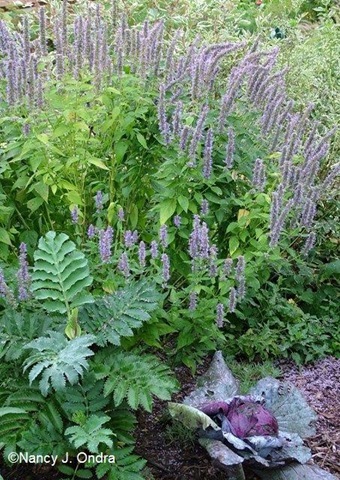 Last year I started Agastache foeniculum (Giant blue hyssop) from seeds and transplanted about 50 to my new perennial bed. They all looked great, started to bloom – then after a very heavy rain, sitting in heavy clay, they died instantly. One of those things, live and learn! That’s so sad! That one seems to tolerate moisture better than many species; in fact, it’s the only one (besides its hybrid ‘Blue Fortune’) that did all right through our extra-wet growing season last year. But it has its limits too, of course. It is wonderful just seeing some color this time of year. Happy GBBD. Happy Bloom Day to you too, Lisa. At least you had some real blooms to share! Agastache ‘Blue Fortune’ is one of my reliable deer and rabbit proof plants. Mine will fade to a dusty color in our bright, southern sunshine, so deadheading is needed to keep the blooms repeating and blue. I’ve also found that Blue Fortune can take a bit more moisture and closer quarters than other agastache varieties. 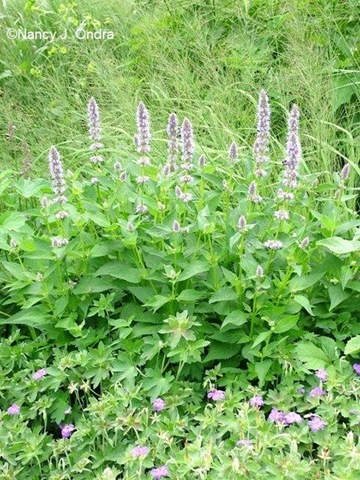 I use it planted it thickly up against clumping bamboo and pineapple sage to make a “green fence” to block a deer trail. Oooh: a deer-resistant “green fence” that also has pretty blooms and great fragrance, and that attracts butterflies and beneficial insects too. Nice! Thanks, Nan. I love that idea about dividing them IN the ground. Kind of a no brainer I guess, but I never thought of that. Took me a long time to figure it out, but it’s made the job MUCH easier. I was ready to move to Pennsylvania until I read in the comments that you grow melianthus as an annual. I tried keeping one as a pot plant to bring in for the winter, but it succumbed to whitefly after a couple of seasons. I love the height and structure of agastaches. The blue fortune is nice, and I also have a crazy tall (10′) white one whose name I forget. The chartreuse leaved variety is okay, but not tall or vigorous enough for me. Thanks for posting on what is a fairly underused perennial in my neck of the woods. Hey there. Welcome to the blogging world! Is your really tall agastache truly white or kind of a creamy color? I remember Agastache nepetoides being gigantic, but its flowers were so pale and so high up that it wasn’t much of a show. Before I read your comments about the melianthus above, I was thinking how well-mannered yours is! They get huge and sprawly here in zone 10 and need constant cutting back. Gets whitefly here too. I found a couple ‘Red Fortune’ agastaches last summer that seem to be holding on through the winter. But I’m eyeing with dismay the ever-shrinking clumps of some ‘Black Adder’ planted in late fall. And I find the yarrows generally behave for me as you describe — not much after the first great flush. So glad to find a blog that wasn’t enumerating the charms of a winter landscape. It seems a perfect use of winter time, reflecting over what works and why. Thank you! I appreciate your visit, Denise. I’ve had my moments of rhapsodizing about winter beauty, but this year, I’ve already had it with cold and dreariness. I’m ready for spring! My grandkids call this “the root beer plant” and we like to sample the new leaves in spring. Not so tasty by fall. Thank you for your lovely photos and wise words. It does give me a pang to see the lush growth in your damp climate (arid summer here in the Sierra Nevada foothills). And I envy some of the beautiful species that you can grow that I can enjoy only as annuals, if at all. Moist soil (especially in winter) is no friend to many agastaches.